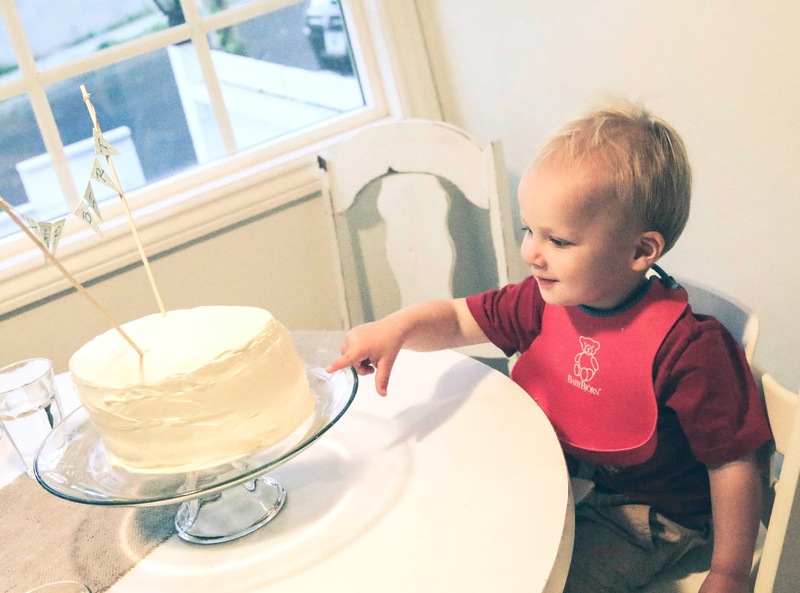 Our little guy is 1 and a 1/2 years old! These have been unquestionably the best 18 months of my life. Carson is my best buddy (along with Jeff and Jake). He gets more fun by the day. 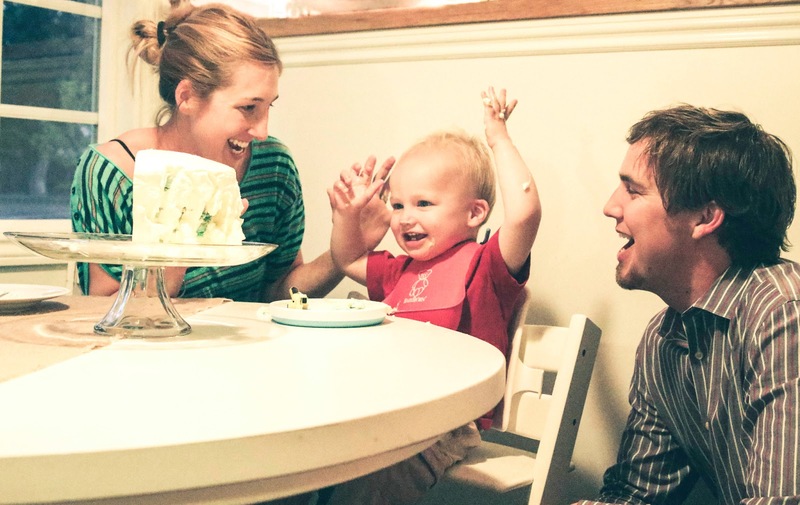 We've experienced so much joy and laughter (and a few tears too) throughout the past 18 months. It's hard to remember what life was like without him. I do remember that it involved a lot more sleeping in and a much cleaner house, but I certainly wouldn't trade a day! Anyway, growing up we celebrated 1/2 birthdays. It's a tradition that I love and remember so fondly. I mean, a year is just too long to wait when you're only 547.5 days old. 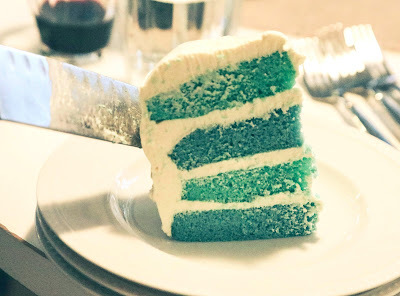 I made him a layer cake in his favorite colors (blue and green), with whip cream frosting. It's a half cake, of course! Here's the recipe for the colorful layer cake (thanks Martha Stewart)! Preheat oven to 350 degrees. Brush your 9-inch-round cake pans with butter. The number of pans you'll need will depend on how many layers you'd like. I only needed two pans since I was making a four layer 1/2 cake. I cut each pan in half! Line the bottom of each cake pan with parchment paper; brush again and set aside. Divide batter evenly between two medium bowls (use a bowl for each colored layer). Add food coloring to each bowl, whisking, until desired shade is reached. Transfer each color to an individual cake pan. Transfer to oven and bake until a toothpick inserted into the center of each cake comes out clean, about 15 minutes. Remove cakes from oven and transfer to a wire rack. Let cool for 10 minutes. Invert cakes onto a wire rack and let cool completely. Using a serrated knife, trim tops of cakes to make level. Use a plate/cake stand or lazy susan to decorate your cake. Place the first layer on the stand and top with desired frosting (see below for the whip cream frosting that I used. Use an offset spatula so it extends just beyond edges. Repeat process with all layers (or half layers if you're celebrating a half bday!). Place the final layer on top, bottom-side up. Gently sweep away any loose crumbs with a pastry brush. Using an offset spatula, cover the top and sides with a very thin layer of frosting (also use any of the excess frosting visible between the layers). Refrigerate until set, about 30 minutes. Beat together milk, sugar and vanilla pudding for 2 minutes. Fold in cool whip until completely combined. Happy 1 1/2 years, Carson. Wow! That frosting recipe sounds delicious.